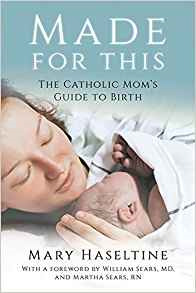 Made for This: The Catholic Mom's Guide to Birth is the first book on the topic of childbirth from a Catholic and holistic point of view. Birth affects all of a woman - body, mind, heart, and soul. In Made for This, the Catholic woman can learn how to understand, prepare for, and experience her unique birth in all those ways through the lens of her Faith. Steeped in Catholic teaching and in an understanding of the Theology of the Body as taught by Pope Saint John Paul II, Made for This helps you invite the One who designed it all in the first place to permeate your unique birth...no matter what kind of birth you have. Topics include: birth plan decisions, preparing your body, mind, and soul for motherhood, the theology of birth, practical guidance and tips for before, during, and after birth, cesarean birth, healing from birth trauma and handling loss, and so much more. Filled with first hand testimonies from 40 Catholic mothers as well as wisdom from popes and saints, Made for This can help make your unique birth everything that God wants it to be for you and your baby.